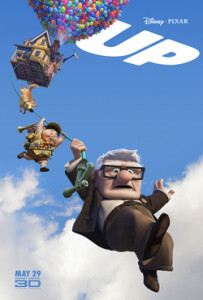 Up starts with eight-year old boy Carl Fredricksen who is a big fan of the well-known explorer Muntz. Muntz stains his reputation when he claims to have discovered the skeleton of a giant exotic bird at Paradise Falls. With his popularity gone down the drain, Muntz promises that he will catch a live specimen of the bird someday. Carl meets another Muntz fan, Ellie, whom he befriends and eventually marries. The couple aim to go to Paradise Falls someday but before that can happen, Ellie falls ill and dies. The time comes when Carl grows old and lives along in a neighborhood about to be torn down for construction. An incident causes him to make an improvised airship using his house. He puts up a lot of helium balloon atop his house and before he can take off, the young Russell knocks on his and gets caught in his journey. The two is taken away by the flying house and they eventually end up in a place on the other side of Paradise Falls. Carl and Russell tie themselves up onto the house and set on exploring their surrounding while pulling the floating house behind them. Along the way, they meet a tall flightless bird which Russell starts to call Kevin. They also meet Dug, a dog equipped with a special collar that can make him talk. As they go on with their journey, a pack of dogs ambush them and take them to their master who turns out to be Charles Muntz. Muntz takes Carl and Russell inside his dirigible and starts filling them with his stories and search for an exotic bird. Russell notes that the bird Muntz is describing sounds like Kevin. It is at that moment that Muntz accuses them of trying to steal the bird from him. The pair try to escape with the animals but Muntz gets ahold of Kevin and sets Carl’s house on fire. Carl has no choice but to let go of the bird so that he can put out the fire on his house. Because of this, Russell gets disappointed with him for letting Muntz take the animals. When he rummages inside his house, Carl finds a memento from Elli encouraging him to make more adventures with the rest of his life. Carl gains inspiration and sets on finding Russell who at the moment is going to save Kevin on his own. Carl then gets rids of his furniture to make his house lighter and follows Russell. Russell gets caught again by Muntz but Carl comes to the rescue and saves him along with Kevin. Dug manages to defeat the dogs’ leader and becomes the head of the pack. Muntz continue to pursue the group but their struggle cause Muntz to fall from the dirigible. Carl and Russell find Kevin again which now have her new born chicks with her. They use the dirigible to get back home. The movie ends with Carl awarding Russell his final badge while his house lands on the cliff beside Paradise Falls.